The Twilight games below include the best Twilight dress up games, Twilight makeover games, puzzle games and trivia online. You'll have a great time playing these Twilight games that include Bella, Edward and Jacob as they fall in love and battle vampires along the way. Have more Twilight fun with my list of Twilight dress up games! In this stunning Twilight game, it's up to you to makeover a very realistic looking Robert Pattinson into Edward Cullen. What hair color, eye color and clothes will you choose for him? Bella needs your help getting ready for her date with Edward! Help Bella pick out the perfect outfit in this Twilight game. Jacob is on his way to try to convince Bella to go out with him. In this Twilight game, you get to help Jacob get dressed for the big moment. Will Bella say yes? In This Twilight game, you get to help Bella kiss Edward and Jacob! Just make sure you don't get caught by the other one while you kiss long enough to fill in the love meter. This is a Twilight game where you color in the cast of Twilight right on the computer. All your favorite characters are there - Edward, Bella, Edmond, Alice, Rosalie and Jasper. A very cool Twilight game where you get to give all three Twilight stars a new look. How will you transform Edward, Bella and Jacob in this Twilight game? Chose from 7 Twilight photos to turn it into a Twilight puzzle in this challenging Twilight game. How fast can you solve the puzzle? In this Twilight game you get to dress up Kristen Stewart. Choose her clothes, makeup, hair style and more in this fun dress up game. Dress up both Bella and Edward in this fashionable Twilight game. Try dressing them up for a date, the prom or a camping trip! In this Twilight game, you're dressing up Edward, Jacob and Bella for a night out on the town. Pick out their clothes to make sure they're looking they're best. 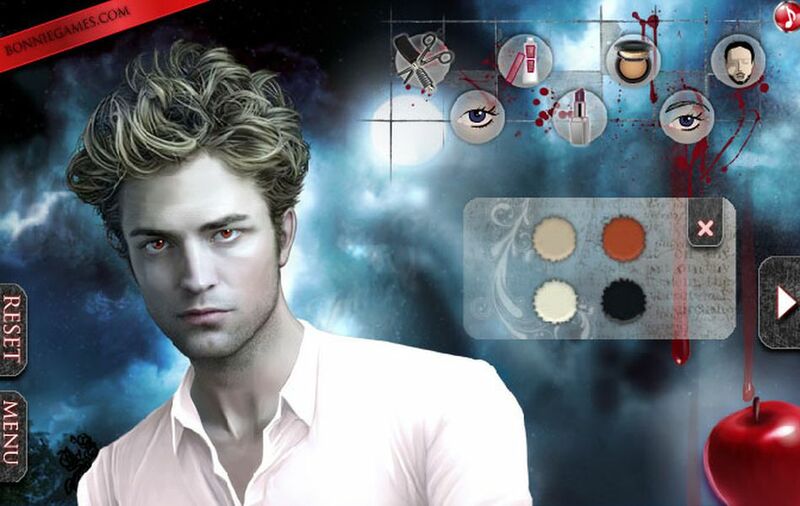 Try your hand at this Twilight game where you give Robert Pattinson a makeover. Can you transform him into Edward Cullen? Edward and Bella have a date tonight! Play this Twilight game by dressing up Edward and Bella for a night out on the town. Edward needs to be dressed up in this fun Twilight game. Drag and drop the clothes, shoes and accessories onto Edward to create the ultimate vampire outfit. Style Edward and Bella's hair, makeup, outfits and more in the Famous Couples Twilight game. This is a stunning picture of Edward and Bella and you'll have a great time getting them ready for a night out on the town. Kristen Stewart needs a makeover! Can you help her find a new look in this Twilight game? Use the tools to style her hair and makeup. You can even see a before and after of your makeover. Taylor Lautner needs a new outfit before he goes off to talk to Edward in this Twilight game. Can you pick the perfect outfit to transform Taylor into Jacob? Robert Pattinson is having a hard time deciding what to wear today. Use the outfits to dress Edward in a shirt, pants, shoes and sunglasses in this fun Twilight game. In this Twilight game, Edward Cullen is running late for Bella's graduation party! Help Edward choose what to wear so he can make a grand entrance at the party. Another Kristen Stewart makeover Twilight game waits for you! Choose Kristen's hair, makeup, clothes and accessories to give her a complete makeover. Slide around the puzzle pieces in this Twilight game to complete the picture of Edward and Bella. Try this puzzle again and again to see if you can beat your best time. Can you kiss Edward without getting caught by Jacob? See which guy Bella likes to kiss the best in this flirty Twilight kissing game. In this Twilight game, Kristen Stewart is all mixed up. Perhaps it's because she just can't choose between Edward and Jacob! You can help Kristen get her head in the right place in this Kristen Stewart puzzle game. Color in this very cool image of Edward, Jacob, Bella and the wolf pack in this Twilight game. Use all the colors in this online coloring page from Twilight New Moon. Edward and Bella are happy and in love. In this Twilight game, you'll need to get them dressed up and ready for a date. Where do you think Edward and Bella should go on their date? In this 15 question quiz, you'll be asked questions about the perfect boy for you. At the end you'll find out whether you should be on Team Edward or Team Jacob.